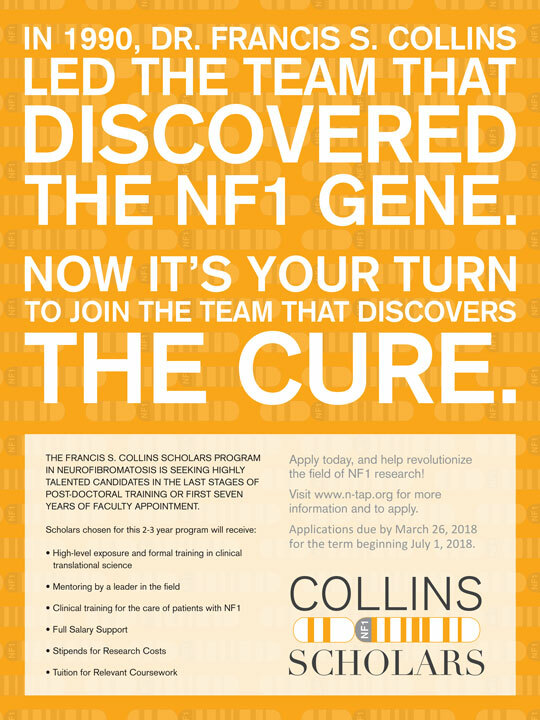 The Francis S. Collins Scholars Program in Neurofibromatosis Clinical and Translational Research is designed to build a community of exceptional clinician scientists who will lead neurofibromatosis type 1 (NF1) research and clinical care. “Collins Scholars” will receive essential support and resources that will enable them to focus their efforts on improving treatment options for people with NF1. Hold a health-professional degree that permits patient care – this is a mandatory requirement. Commit a minimum of 75% and up to 100% of professional effort to the program for a minimum of two years and a maximum of three years. Be in the last stages of post-doctoral training or a junior faculty member within seven years of the first faculty appointment. Have a commitment to patient focused research in the field of NF1. A redirection in focus from non-NF1 research to NF1-focused research is welcomed, but must be explained by the candidate and mentors. Demonstrate prior research commitment and accomplishments. Have a mentorship team that includes research, clinical and career mentorship (these roles can be filled by up to three people) with commitment to the candidate’s training, expertise in the research skill set proposed in the application and in the clinical management of NF1. 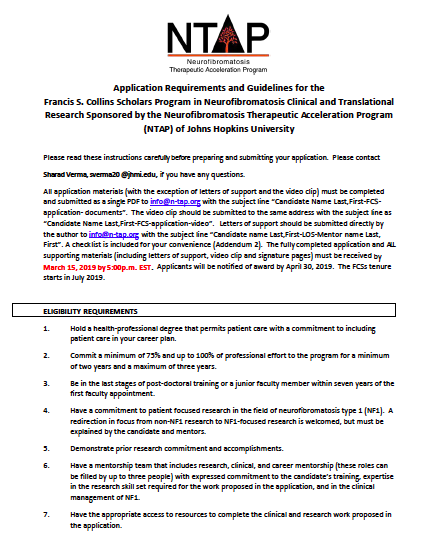 Agree to meet all of the requirements of the Francis S. Collins Scholars Program in Neurofibromatosis Clinical and Translational Research, including participation in all required Collins Scholars meetings and activities. The program was launched in 2014 and nine Scholars have been inducted into the program since then. Applications are solicited annually, usually by the end of December and a due date the following March. For further information about the program, please see Collins Scholar Application Guidelines and Instructions and the document on the sidebar. The Scholars Program is named in honor of Dr. Francis S. Collins, who led the team that discovered the NF1 gene in 1990. In addition to this work, Dr. Collins has been at the forefront of advancing translational science in his roles as Director of the National Institutes of Health (NIH) and former Director of the National Human Genome Research Institute. His leadership helped to establish the National Center for Advancing Translational Sciences (NCATS) and Brain Research through Advancing Innovative Neurotechnologies (BRAIN).